Happy Winter Solstice, on this green (where I am) December 21st. Just popping in to wish anyone that reads this happy holidays. See also these adorable little bead woven angels created as tree ornaments. I am thinking of creating earrings as well. Turns out my design (though made to specifications!) was a bit too ambitious, and the high metal to glass ratio made this piece a bit too heavy for my friend’s delicate ankle. She loved it, but just couldn’t really wear it. 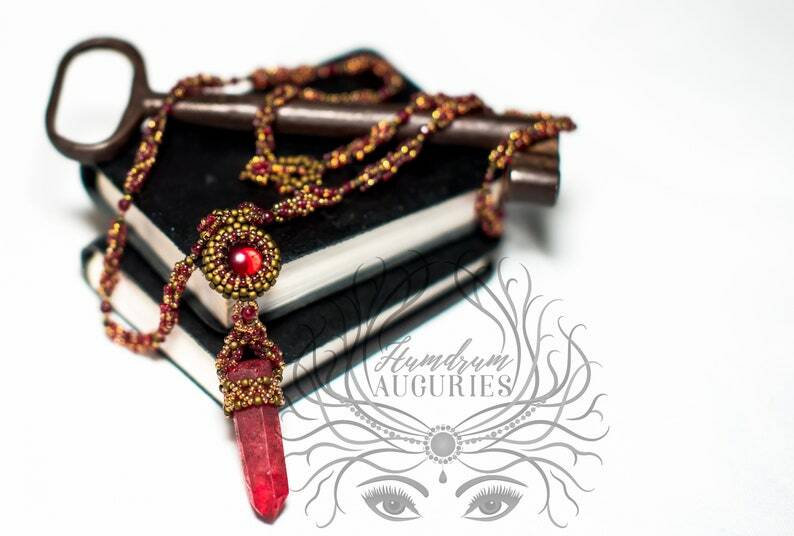 What is a beautifully handmade jewelry piece without its wearer? We discussed possible solutions, and decided to transform the anklet into this incredible bib statement necklace. And surely, I did not forget her original desire; ankle jewelry! 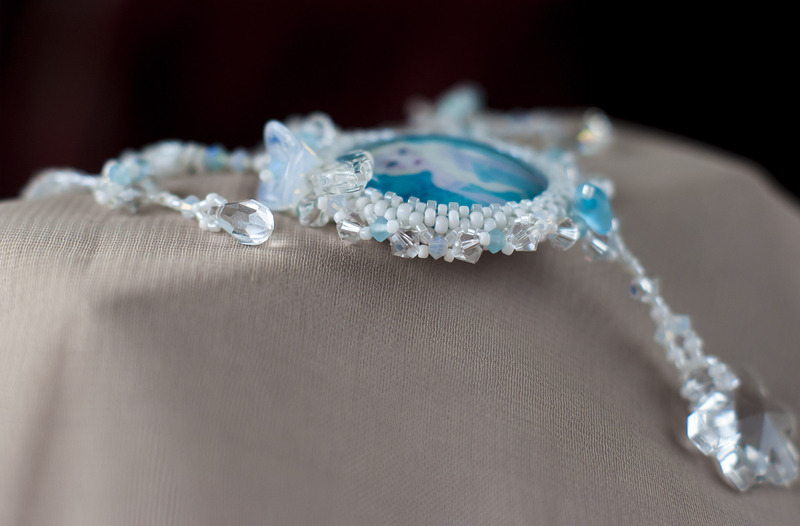 I created this smaller scaled, matching anklet as a special surprise. Have you ever come up with something creative as a solution to ensure a client’s satisfaction? 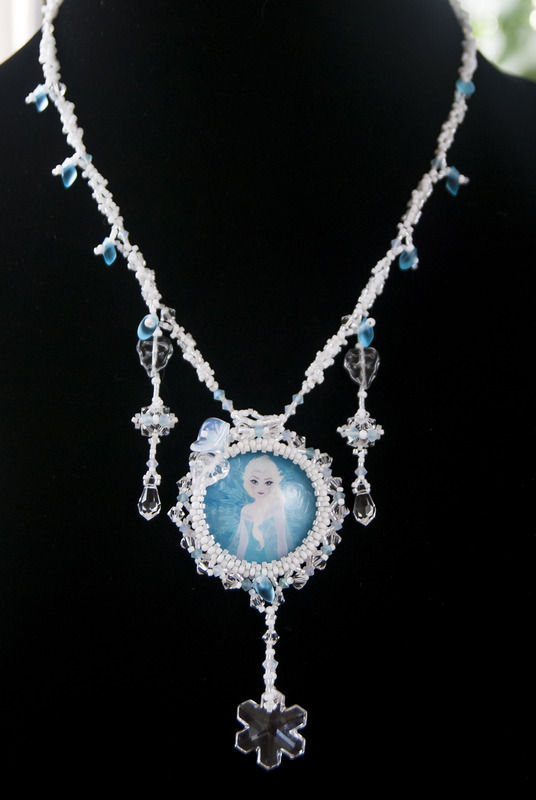 A new winter themed necklace now available on Etsy! The Winter Tree of Life is firstly a celebration of the crystaline beauty of winter. It is also a promise that though nature has seemingly died, spring will return. A perfect gift for someone who may not fully enjoy the darker months of the year! The frosted white colour seemingly glows in sunlight and contrasts beautifully with dark tones. The tree of life is a powerful symbol for the symbiotic relationship between all living things. It relates to the immortality of nature through the endless possibilities of diversity, thus becoming an important icon of fertility. As I peruse bead-woven designs at least 2 hours a day; I rarely find something completely new. Bits and pieces of components I have often seen are realigned to create a new result- but is a designer closer to an inventor or an interior decoration? I would really love to hear the opinion of tutorial makers. A design, according to my observation is the union of 2 empirical elements, pre-existing bead-weaving techniques, (have you invented your own stitch techniques?) and sets of particularly sized material (thank you bead manufacturers)…and of course 1 intangible element, artistic experience. This means that any particular design becomes a whole new design the moment you alter one of these 3 elements; changing up techniques, changing the size/shapes of materials , and different weaving hands experienced to their own fields. This way, many can claim to have created a design, that is really constructed from many pre-existing concepts and techniques. I rarely purchase pre-made project tutorials. I don’t have anything against them, it’s a great way for a beader to use their expertise and market to other beaders in a warm way. Typically, when I have purchased books or tutorials, it was to see up close how an expert applied a technique, to understand a variation I couldn’t figure out in simply looking at the image (I often can). The artistic experience of a designer can sometimes be observed in a tutorial; passing on tips regarding tightness, special knowledge of exactly how many layers of fireline can fit in a 15/0 delica before it cracks, or how many times you can run through a line of fringe before it becomes stiff and looses it’s dangling charm. Tutorial makers at the very least should earn their living from these unmatched elements. A good teacher can turn years of self-learning into a few weeks of practice with similar results…but to what extent to they “own” the various bead-weaving technique components employed, as opposed to the literature/instructions they created? I believe there’s a difference of credit involved between someone recreating a design exactly, as opposed to simply using a tutorial as a spin-off starting point. Where is the line in the sand? I must admit, I am a bad tutorial consumer- I have never really purchased a pre-made project tutorial that I actually completed to it’s intended use. I have always simple used what I learned to create my own designs. Do those experts claim ownership of my new earn skills, and therefore any possible designs I may create from them… or simply the words they have laid out and the exact replication of their example piece? Many behave as though they own the knowledge; are they right? For this reason, I find many tutorials…dangerous. Posting an image of a design is dangerous enough for those who are paranoid and fear plagiarism, but it seems that many tutorial sellers face this danger head on, sword in hand. As the consumer…I find myself at the end of that sword. These sharp words “personal, non-commercial use” are especially deadly to any potential purchase I, as both a beader and a jewelry maker/seller, could have made. Why? Because I find myself to be the culprit of design pilfering no matter what I do, consciously or not. The moment I look at your design, let alone instructions, the techniques I see will forever be part of my own designing arsenal. This is why, even if I find your tutorial gorgeous, want to give you my money and try it out, those “personal, non commercial use” words scare me far far away. I am the reluctant design Succubus. I would rather not poke your design at all than be somehow exposed to knowledge I cannot unlearn…and perhaps have my designs forever bound to yours. I therefore only purchase tutorials from artists who ask to be credited (always glad to do that!) but don’t limit the amount of pieces that can be sold once recreated…This is for my own sanity above all else. As explained above, I would never consider an isolated technique learned for a tutorial, modified and realigned in a different piece to “belong” to a tutorial artist…but I fear your wrath nonetheless…to the detriment of your business! I think Peyote Stitch is becoming one of my favorite mediums for beading. Reading about the technique, I learned that beaders everywhere consider it to be meditative work; because of the simple yet skillful repeated flow of the needle. This was a big project and lenghty, where chaos would meet beauty. 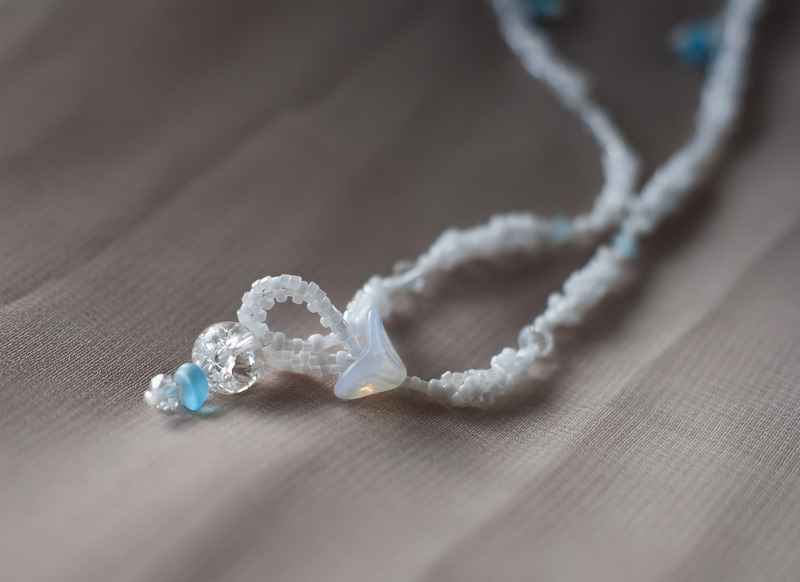 It is a bit longer than a bracelet, intended as an anklet. The wearer chose metallic coloured and wood beads, wanting an industrial look yet organic look. This is my favorite feature of this anklet, the gold “wing” shown above lifts to show an under layer of copper strips, hanging on to a curved metal tube. I have always wanted to bring out my own inner geek through my clothing and jewelry. The things that we love should not be a secret, fandoms are made to be shared! Being one who’s loved Hans Christian Andersen’s original Snow Queen story; I was a bit secretly disappointed that she was truly the antagonist of the story. She is a metaphor for cold and heartless logic, devoid of the human element of emotion. She is a powerful image, but not a hero, merely a fantastical demonstration of how terrible a diet of nothing but reason can make us. She is beautiful, yet as rash and real as sharpened ice. I made this for a Snow Queen fan (is that you?). 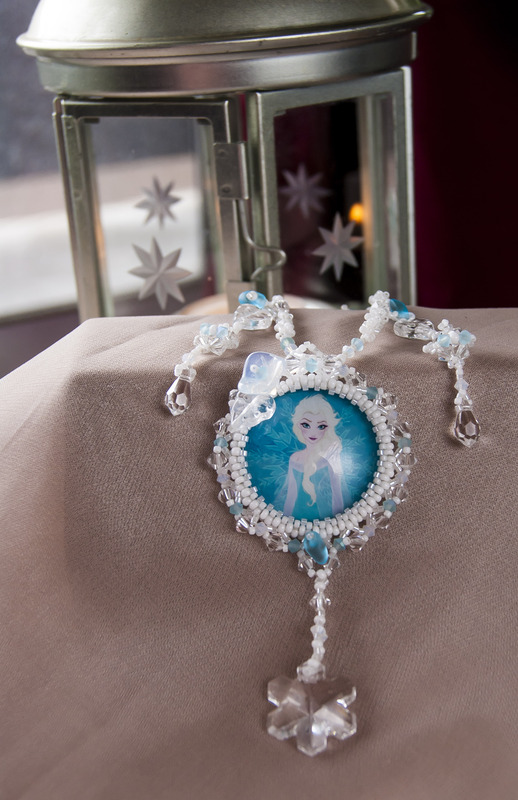 The Queen Elsa Necklace is an ideal holiday accessory. 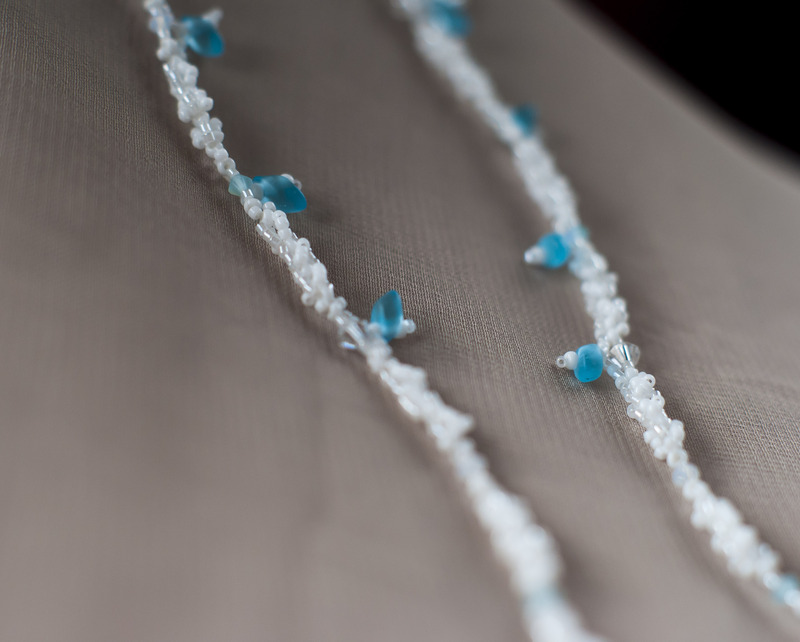 Bead woven little snowflakes dangle on either side, hanging on frozen leaves. Snow flurry rope with dangling icicle. The clasp, make with a crackle glass bead. 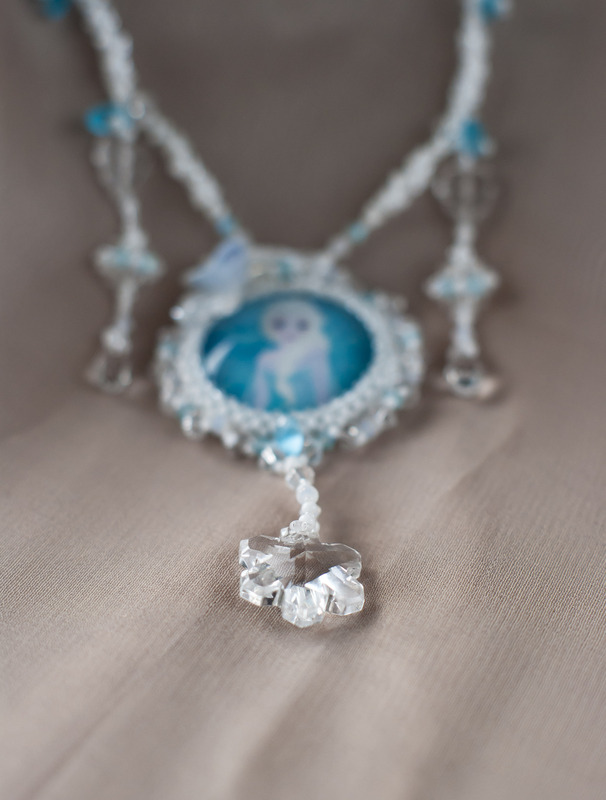 A better look at the gorgeous Swarovki snowflake crystal pendant.